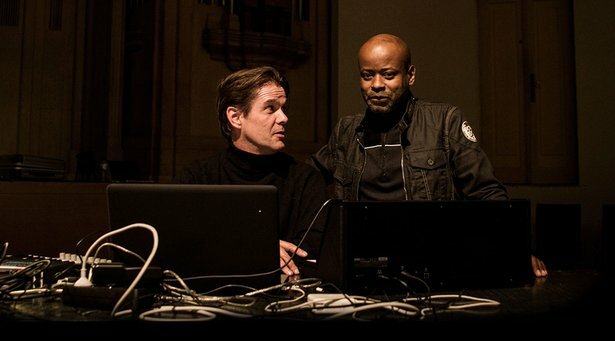 Juan Atkins and Moritz von Oswald have each played a crucial role in defining and later expanding what we have come to know as techno. Connecting the dots between the music of Detroit and Berlin, their respective hometowns, the pair first worked together in 1992 as 3MB. Since then, they have each produced a monumental body of work – von Oswald with his Basic Channel, Maurizio, and Rhythm & Sound imprints (together with Mark Ernestus), Atkins under his own name and as Model 500. Their new collaborative project, Borderland, is an immersive trip into a landscape shaped by subtle shifts of space, tension and texture – all propelled forward by the steady subterranean pulse of bass and kick drum. 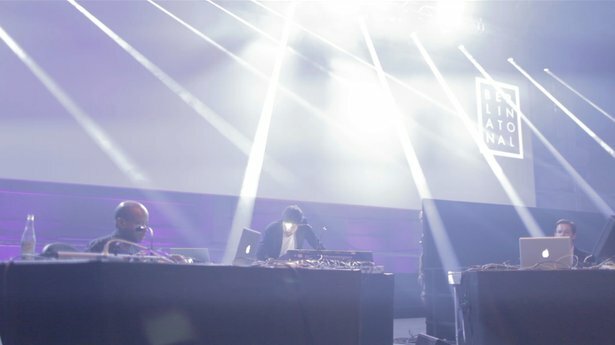 We caught Borderland’s performance at last year’s Atonal festival on film, check out the footage below. Plus, we managed to chat with all three members about their past, present and future ideas and methods of making music. When you’re on stage with Borderland you’re working the mixing board along with a few effects. Was that the case when you were in the studio? Exactly. The live setting is effectively taken from the studio situations where the music was created. In that sense, the mixer really does act as an instrument – the vehicle for getting the sounds that Moritz, Juan and myself are making and processing them. The mixing board as an instrument – this idea has its own tradition. Both dub and techno emerged from this realization. Since both of your Borderland bandmates are well known in these fields, were you thinking about your role as continuing in a certain tradition, or perhaps breaking away from it? It was important for us to get the live situation as close as possible to the studio sessions as far as feeling goes. At the same time its important to retain the freedom to improvise. It’s a matter of being able to produce spontaneous ideas that align themselves around the ongoing themes. Borderland tracks came about in lengthy production sessions. For Moritz and Juan this was a fairly familiar way of working, they probably worked in a similar way for Model 500s ‘Sonic Sunset’ or ‘Starlight’. But now it was more about finding a common denominator. You and Moritz go back a long way, can you tell us when and how you first met? Oh wow, I think I met Moritz when he came to Detroit. Him, Mark Ernestus and Thomas Fehlmann, they would come to Detroit some time back in the early 90s to buy equipment from different pawn shops. They were buying up all of this analogue gear and things from all the pawn shops in Detroit and they came by my apartment one day. I was in the same building with Mike Banks and UR and they were visiting the building and came and knocked on my door and introduced themselves as some guys from Berlin who just wanted to meet the Detroit pioneers. And from that point, when I went to Germany I met with them and went to their studio and did the first 3MB projects...and things of that nature. It just kinda went on from there. What's the difference between working with Moritz then and now? And what has stayed the same? Just the camaraderie between me and Moritz. The chemistry between us is the same. Y'know, we pick up on things, he can be working on a line and I can pick up and take it in a direction and vice versa. There's not a lot of talking and not a lot of complication and trying to figure out what we do, it just comes naturally. What were your go-to production tools then? Was there something that you used on every track? Nothing that we would use was a go-to. I mean the whole beauty of working with Moritz and all of the things that they bought when they were in Detroit, all of these different analogue pieces, was to try something new. I mean he had all of these machines retro-fitted with MIDI, so they were all synched with each other and we could play them together. The whole fun of it, was to try and use different equipment on each track. I mean of course the rhythm section, the drums, probably would be the only thing that tended to remain the same – like of course an 808 and a 909. So if anything those were probably the only things that would remain constant through all the productions. For the production of the Borderland album did you and Moritz, and Laurens have different duties, different roles like a band or did everyone do a bit of everything? Yeah basically we all just jump in and do what we feel. I mean no-one is relegated to certain things. I guess that I probably would have the tendency to do more drum programming...but outside of that I think we all tried our hands at different aspects. Sometimes Moritz can do drums, sometimes Moritz does chords. Sometimes Moritz does the lead lines, sometimes Moritz does the basslines. And same with me and with Laurens. 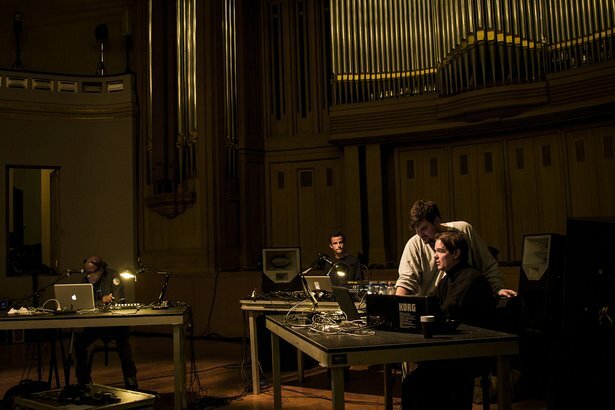 What was it like playing in a space like the Kraftwerk in Berlin for Atonal festival? Oh man, it was great, the space is of course as you know a huge space in an old power station. Something about that industrial feel and the grit and the huge sound just made everything just feel really big. The bass had to be big, everything had to be big to fill the room. It was quite an experience. What did you end up doing with Push onstage? Basically all of the drums, I program and I play all of the drum patterns, all of the drum arrangements so what I'd do with the Push is that I put different drum patterns on the different clips – the buttons on the Push would represent clips on the program. And depending on how the show was going and how I feel I just go through and do live arrangements with different drum patterns and maybe the bassline or other instruments. Yeah I knew some of tracks he did a little bit before we went. We didn't start immediately. We were introduced to each other through Dimitri (Hegemann) from Tresor. I mean I had another partner I worked with at that time, Thomas Fehlmann, and he was also interested to get this collaboration together and so we met in Berlin and we just started to develop some tracks. Because you've had this long break between periods where you've worked with Juan, are some things different now compared to 20 years ago? No, I think the freshness that we have in the two of us is still there. I was also very curious about exactly what you say, if something had changed between us. But nothing had, and the two of us were looking forward to get in the same spirit and this really worked out. We still like the same sound, still have the same way of seeing a draft, a musical draft. This was something we didn't repeat but it was something that we knew each other for and this was kind of a trust thing, you know? Sometimes I think it's quite difficult to go into the studio with somebody when you don't know anything about this person. I mean it can happen of course but I think it's much more comfortable if it's somebody that you know personally and we're friends. We have the same musical preference, which is of course electronic music. So we know from each other that there is something we can rely on. Which means as I said it's not repeating something it's just kind of a knowledge of each other. Speaking of the differences between working then and now, what were your production tools were when you first started working together and how that compares to your set-up these days? Well of course the computer programs that we used at that time are different to the ones that we are using now. I mean I think this leads to a question about Ableton but we have used Ableton – we didn't use it back then because it wasn't really existing – but we did use Ableton this time. And it really fits our way of working – just to be spontaneous and to get things done – it's quite lively, very quick and very effective. Both you and Juan are known for using hardware, and of using it very effectively. Is there some gear you always want to have around? And maybe related to that question what do you think about the whole idea of the fetishisation of musical equipment, be it hardware or software? Well of course you know I was collecting electronic hardware, like synths and all these items which are still a help and I'm still using. So yeah I'm using some hardware synthesisers. I don't want to build up any myths here, but I'm really comfortable with some of this hardware and I think it really depends on how well you know these things. It's the same with the soft synths and drum machines and all this stuff. It just matters to me how it sounds and I have some old synths that I just really, really love. Is the live presentation of Borderland just a matter of taking the studio situation and putting it in front of people, or were there some specific preparations you had to undertake to present Borderland in a live context? Well I think if you have the production which is kind of an artefact, I would like to overcome this, to have a live performance which is a step further than an artefact, than the CD or whatever. I think live it is very important that you take chances and go further than the production or than the recordings. So my approach was to do something in addition to the recording which means bring some different instruments, or different elements and different arrangements. It depends on if you have enough energy or ideas to go into this, but as I said it's kind of a different preparation and a whole different approach. And were you happy with the presentation at Atonal Festival? Yeah I was feeling happy, I mean you know sometimes some technical things are not working 100% but this is something I'm not really disturbed by because this is part of a live concert – that things are not really working from the first minute, you know? It just happens sometimes. Like at a classical concert where you can have a timpani which is tuned wrong or the string of the violin breaks or some difficulty with whatever acoustic instrument. You know electronics are not always as reliable as you think. So I think something can always happen, but this is part of the game.